After a night with a lousy sleep I went to the breakfast room and found Roger and asked him if he could help us to solve the problem with our car . No problems, he had two spare wheel studs and another guy that had an extra nut. The repair of our car was then quick done by Joel, the wheel studs was changed without any bigger problems. And now the wheel angles also looked a bit better after yesterday’s adjustment. We had breakfast, packed our gear into the car and checked out from the hotel. We drove southeast, down to big river and then over. Today we were the hare passing the tortoises several times as we missed lots of questions when driving to fast. 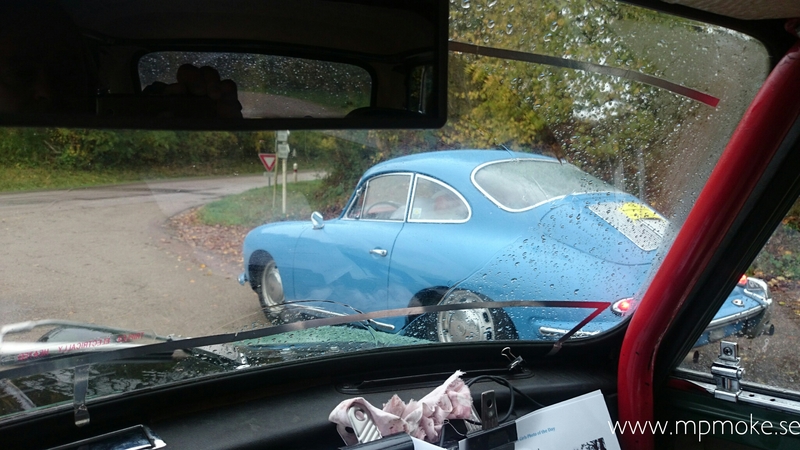 We overtook other teams, met them when we were going back and then overtook them again. There were several questions, two photo questions and code boards to find during todays section. We got to the manned passage control, had some coffe and then took off on the ladt stretch, over some mountains and then up towards the goal at Alpes d’Huez. 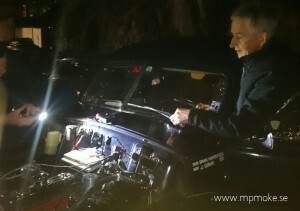 The other swedish team in the Volvo Amazon had had some problems , the car had some hickups but after removing the air filter and cleaning the petrol filter it ran again . They catched up with us and we had a nice drive together, many photo opportunities with the cars driving in the beautiful scenery with the high mountains that were all around us. It was a very nice sunny day and we stopped several time to take photos and to see the views. 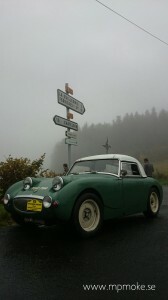 We filled petrol and then started the climb up the twisty road up to Alpes d’Huez. 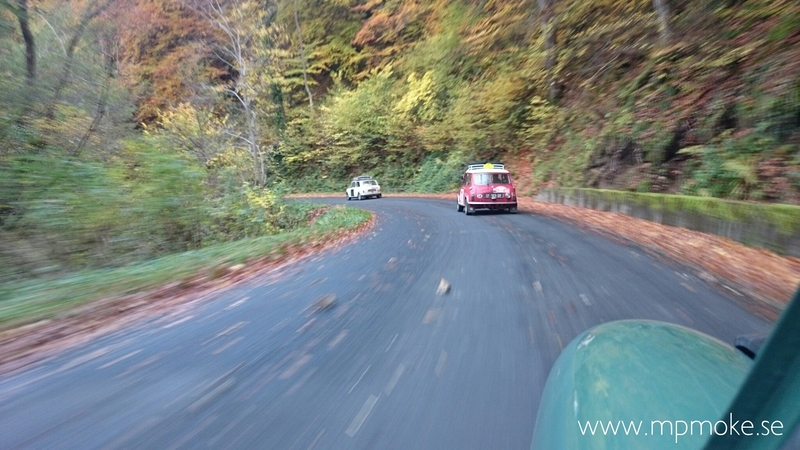 The Cooper is not the fastest car going uphill, especially not fully loaded! Yippee, we reached the goal, the ski resort of Alpes d’Huez, and we had climbed the famous road known from the Tour de France bicycle races. I think we were one of the last cars to reach the goal. We completed our sheet and then handed it in to the marshals. After photo session we went looking for lunch. We were a bit late and the only open restaurant closed as we entered…. We decided to skip lunch and to begin the descent and drive to the hotel for the night, Novotel in Vorleppe, North of Grenoble, some 80 km away. We eventually found the hotel and parked amonh the other ralky csrs outside. 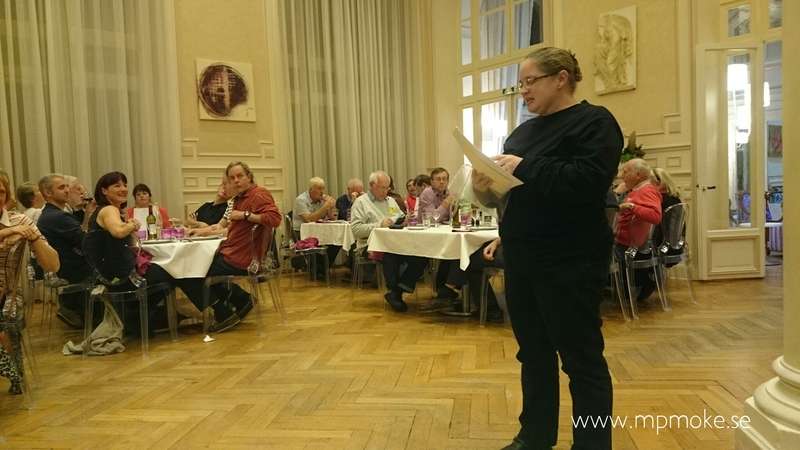 All teams gathered in the bar to celebrate the end of the rally before showers and dressup for the gala dinner and prize giving ceremony. We did the other way around and started with a quick shower and then the celebrations started . 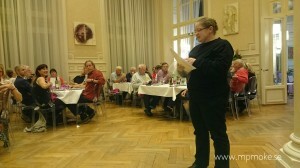 The dinner was very nice and then the results came! The other swedish team, in the Volvo Amazon , Marika and Thomas, really scored. They got mentioned for very nice protocols and it turned that they were the Winners of their class and second overall ! Big congratulations! Our team ended up in place 26 of 48 finishing teams. We were happy , we had resched the goal and had really fun along the way. Were were also taking part of the team challenge and was beaten with very small margin. 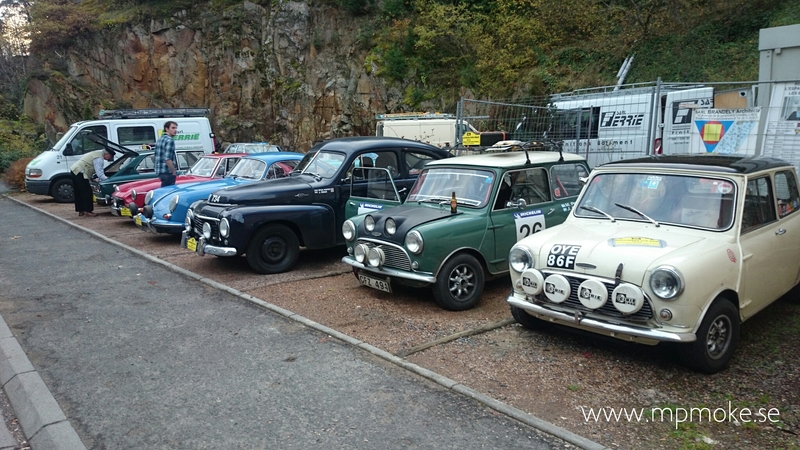 Our team was called FAST – French Anglosaxon Swedish Team as we had one car from France(Jan and Dave) , one from Britain ( Kevin and Nigel) and one from Sweden(Micke and Joel) . Donations for charity was collected ad usual. 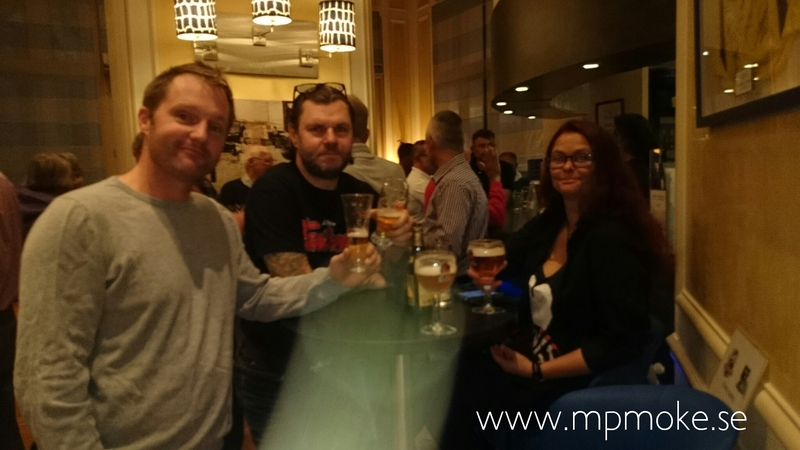 The celebrations continued in the bar after the dinner and everyone was happy! Now its only the travel home left! Planning to be back on Uppsala on monday. This entry was posted in NSR2014 on November 8, 2014 by admin. Start in St Nectaire. We had breakfast, checked out from hotel and loaded the bags in the car. We checked the wheel suspension in front and no loose bolts were found. 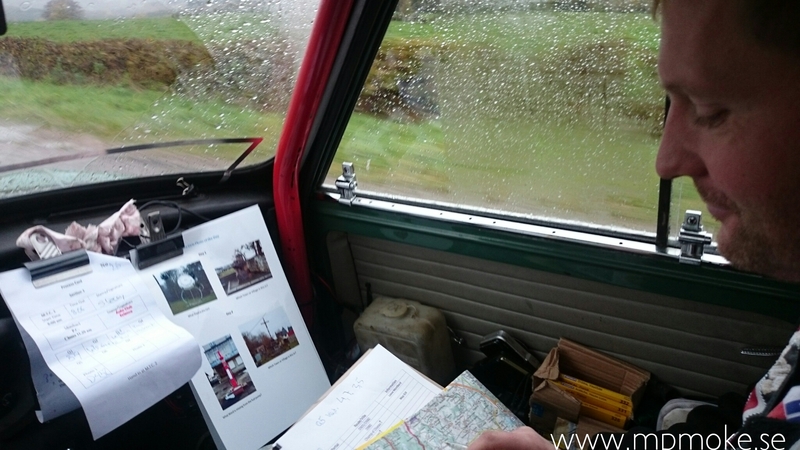 We looked on map that Joel had plotted and saw it was a long transport with some challenges on white roads, some questions to answer and code boards to find. We also thought that our petrol would take us to a bigger town where we hopefully could fill petrol. 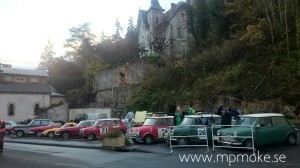 On our start time 08:26 we took off, going south on smaller roads, passed places like Arlanc, Retournac and Yssingeaux. 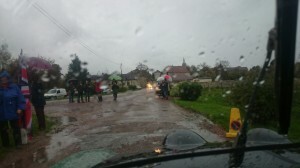 Just before the manned passage control we passed some teams that had crashed into each other, they had apparently been to close to each other and not reading msp in all cars when the main road turned right they drove straight on a smaller road until the first cars realised they were on wrong road and they braked. Bang! Some other teams stopped to help out. Ambulance, fire department and Police came. One Mini was seriously damaged but the crews got minor injuries, one with knee injuries and others with neck problems . Two crews were taken to hospital. We arrived lunch stop in Privas without any bigger problems. 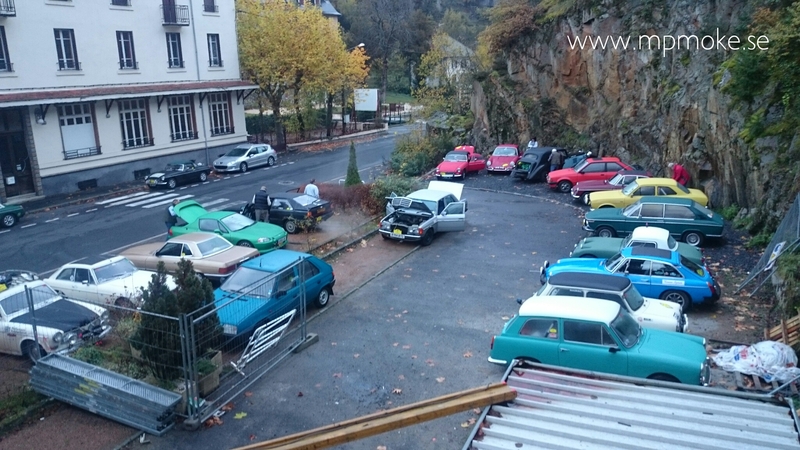 There was some traffic jam in Privas, but that we had experienced already last year as well so that was expected. After a bagutte lunch, discussing routes wirh other teams and a quick check of the car we checked out, opened the envelope for afternoons section and plotted the map. 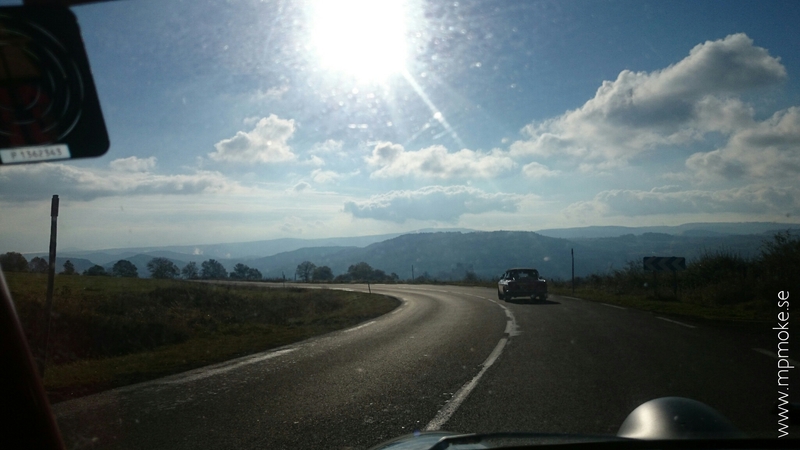 We took off on afternoons section that was in the Ardeche, going west of Privas, climbing up and down, passing places like Mezilhac and Burzak. On very narrow roads and we met several other cars, among them some of the rally cars doing the recce for the Ardeche rally that was going to take part during the weekend. It was really an experience to be in navigators seat! Very intense, trying to read map and at same time lookout to see where we was and to find code boards. No time to think, take photos or doing anything else!. I must say that I’m impressed of Joel navigating, he makes it look so easy. He was also a very good driver on these roads. The ride he gave me beats any ride on any fun fair I’ve ever been to, it was a white knuckle ride with this tiny car on the edges of the windling roads with mixed surface, mostly asphalt but some times, water, wet leaves, sand and gravel on the road! 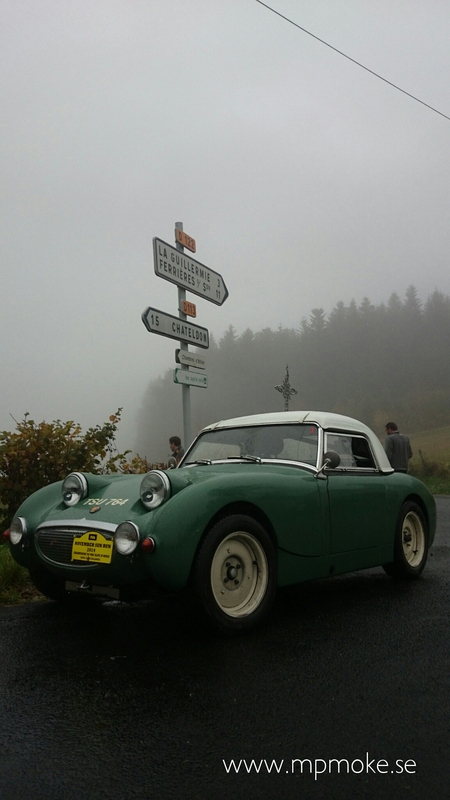 We came down to the big roads and headed back to Privas in the dark. We had learnt the lesson so we stopped at a petrol station and filled up, we managed to put in 25,4 liters in a 25 liters tank so I guess it was time to fill! 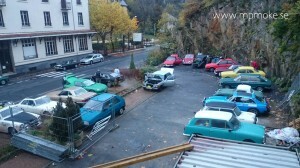 Back at Privas we checked in to our room, we had som beer and then went out to the car and did some mechanical work. The fan belt was slipping so we tightened it. The wheel angles had changed since we left home so we checked if anything had come loose but didn’t find anything. Back out to the parking after dinner to do some more work, we jacked up the car and adjusted the wheel angles. And while doing that we found one snapped wheel stud on left front wheel!!! As we didn’t have any spare we decided to mount the wheel and ask around at breakfast time if anyone had spares. When i tourqed the wheels another wheel stud snapped, on the same wheel! Summary of 5 November, day 2 of NSR2014. After a good sleep the alarm clock rang, quite early up but we wanted breakfast and shower before takeoff, we even had time to check the car for loose bolts in the front wheel suspension . Start order wad reversed today, we now starting at 08.31. We spent a lot of time in the beginning looking for petrol, so we lost time and added distance. We lost even more time when we stopped and helped Jan with ignition problem, twice… But that helped us as we siphoned some petrol from his tank… We got some more petrol from the recovery truck that happened to pass, that was good as we had already emptied the spare can. 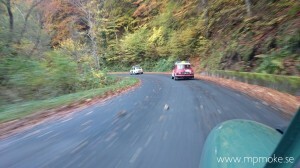 Then there was very active driving to catch up for lost time . Late in for lunch in La Bourboulle (? ), lost 9 minutes…. 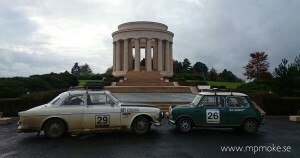 But we had covered at least 223 km so far! We had some bananas, chocolate and coke that replaced lunch. Then off again, this section was only about 100 km . 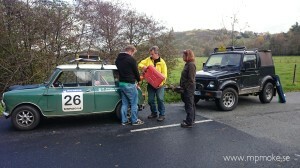 Afternoon was easier, but lot of of fast , active driving, in company with Jan and Dave in the Works Mini replica. 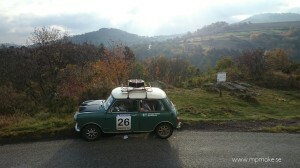 Then another Mini joined is, great fun, very tight, fast and a putting the car on test! Arrived back to hotel in St Nectaire at 17.00. We have practically driven in a circle around St Nectaire today, think the area is called Volcans des Auvergne. Now beer then wash off road dust before dinner. Guess we will do plotting for tomorrow before sleep. This entry was posted in NSR2014 on November 6, 2014 by admin. Navigator Joel doing his work. And doing it well. 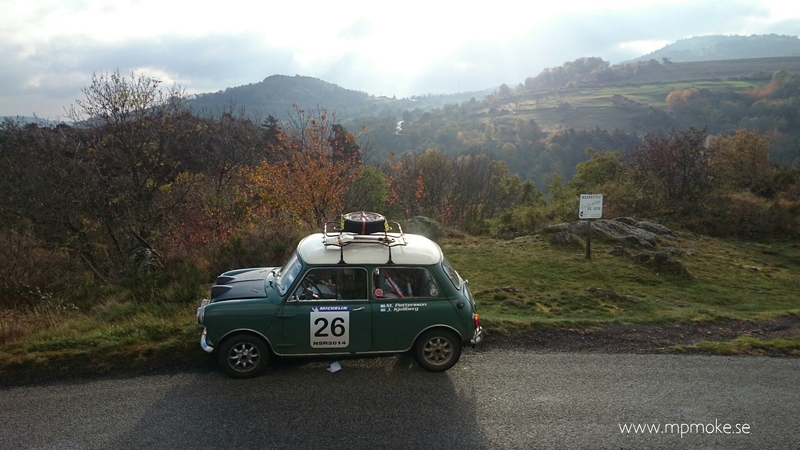 This entry was posted in NSR2014 on November 5, 2014 by admin. Yesterday the NSR2014 started and it was a hectic day! I didn’t really have time to write a resume for yesterday yet. But wrote one for today! Will publish it soon. Will try to sort out some pictures before I fall asleep. This entry was posted in NSR2014, Quick update on November 5, 2014 by admin. We woke up in sleepy village Kedange and skipped breakfast, it was not included, and 8 Euro were none of us interested to pay for a medioker breakfast. Instead we packed the csrs, checked out and took off.. Passed Metz, took off motorway into small roads, we looked for some greenmarked scenic roads and they were actually very nice, but it was not the straightest way so ot took a lot of time to drive. We visited the a monument on top of a hill, Buttés de Montsec. From ww1, a hill hold by Germans for years but they finally lost it after an attack by 550.000 American soldiers, 110.000 french soldiers, a lot of aeroplanes and tanks. We wete noe very hungry so wr stopped for lunch in Joinkil, todays dish for 5,50 euro. Met David Wars and Malcolm at their hotel for the night that we happened to pass some kilometers outside Brienne la Chateau. Calibration of the speedometers were done by driving a known distance, 11,78 km, and read the odometers difference between start and finish. We then drove to Brienne la Vielle to register for the rally. Here we met uo with organisers and several other teams. We went to shop some emergency foid, drinks and fryit, filled up petrol in the Cars, got some money from an ATM. Hotel check in, unpack, wash off road dust, do dome plotting of the map and then off to the reception/welcome dinner. Nice food and friendly people. We drove back to hotel by approx 22.00 and did some more plotting before we went to sleep at 00.00.